Phuket lies off Thailand’s west coast in the Andaman Sea. 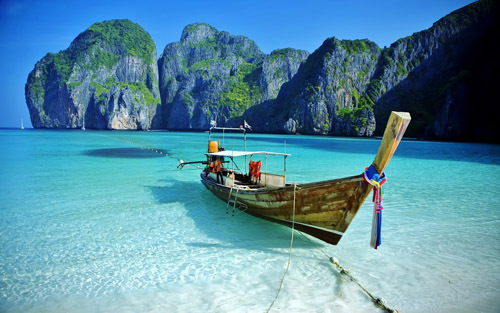 It is one of the most sought after destinations for South African travellers and flights to Phuket are in high demand. The largest of all Thailand’s islands, Phuket has an interesting history with friendly vibrant people and with its crystal clear waters, golden beaches, mountains and lush green rain forests, it’s little wonder that millions are drawn to this island paradise. Besides the sheer natural beauty of Phuket there are temples, museums, markets, shopping malls, cabaret, festivals, exclusive seaside resorts, nightclubs, bars and great eateries to indulge in. High season is from November to April with early November still experiencing rainfall and the North East wind when west facing beaches are best as they’re sheltered. This is when flights to Phuket will be at their peak. Travel, hotel and shopping rates increase along with visitors but it’s still not overcrowded although traffic does get congested. With improved sea conditions, the scuba diving season unofficially opens. December has lots of sunny days with short light showers as the rainy season ends with an increase in visitors for New Year Eve’s celebrations. The busiest month for tourists is January with low rainfall and humidity, clear blue skies and calm seas including much busier streets and the highest prices for accommodation. The hot period approaches during March with April being the hottest month with fewer visitors and accommodation prices somewhat lower, also generally the last month for stable sea conditions with diving visibility deteriorating and increased rainfall towards the latter part of the month. May to October is the low season with the South West monsoon season bringing winds in from the South West and rain. Sometimes these winds make it impossible for swimming with seas being too rough. May has increased rainfall and is the wettest period but still warm with sunshine occurring. A good time to get better discounts on hotels in a more relaxed atmosphere with less visitors but still plenty of nightlife. June is great for cheap flights and accommodation with sunshine, less rain, short-lived thunderstorms and fewer tourists. Bars quieten down with an increase in friendlier service. During the rainy season, July and August encounter warm days, no over-crowding and good rates on hotels in a wonderfully relaxed atmosphere. September is hot, humid and wet as is October, but with the lowest accommodation rates and weather improving towards the end of the month. If you’re not swimming, lying on the beach, diving or hiking there’s still a great variety to choose from to keep you enchanted. Besides nine museums and seven temples there are numerous festivals throughout the year that include the ‘Vegetarian’, ‘Hungry Ghost’, ‘Chao Le (Sea Gypsy) Boat Floating’ festivals. Early November the ‘Phuket Travel Fair’, normally called ‘Patong Carnival’ brings streets to life with sports events, colourful parades and a beauty parade. A sight worth seeing is hundreds of hot air lanterns being released and then floating on the ocean during the ‘Loy Krathong’ festival. The hottest month April has the towns filled with excitement and fun for up to seven days as everyone celebrates the ‘Songkran’ water festival with very few people not being soaked when venturing into the street. Experience the most beautiful butterflies in one of the few remaining butterfly gardens in Thailand, the Phuket Butterfly Garden and Insect World or visit the Phuket Aquarium, a major attraction situated in the southern part of Cape Panwa, surrounded by picturesque bays and islands, it draws approximately 300,000 local and foreign visitors annually. Relax as you meander through Phuket’s Old Town, charming and picturesque where you’ll encounter locally made arts and crafts, textiles and view works of classic or modern art. At the ‘Phuket Weekend’ market you can browse around for second hand items, curios and try out a variety of local foods. For cabaret with a difference don’t miss Phuket’s Simon Cabaret, a transvestite show that draws thousands for a night of fun with dazzling colourful costumes and a show that you’ll never forget! The Phuket King’s Cup Regatta is hosted by the Kata Beach Resort during December as is the Laguna Phuket Triathlon. For tourists that can’t go without their game of golf, there are six great courses to spend time on. With no less than 10 spa resorts, spoil your tired body and lose your mind as you’re pampered with a luxury, romantic or innovative spa treatment that will leave you feeling brand new. Taking a metered taxi is cheaper than taking a ‘tuk-tuk’ but there is a shortage of taxis. The ‘tuk-tuks’ are little red, three-wheeled vehicles that struggle up steep hills with their two-stroke engines but are ideal for getting around town quickly. Convenient for short trips but probably not the safest are motor-bike taxis found on street corners with driver’s wearing red or green vests. Always first agree on the price for both tuk-tuks and motor-bike taxis. The local bus service is cheap but not comfortable as it’s basically a truck with two benches along the sides and sometimes one in the middle and while you won’t get to your destination in the fastest manner you will enjoy the ride with happy local people. Hiring a longtail boat is an ideal way to view or spend time on smaller islands. Reputable car hire companies like ‘Hertz’, ‘Budget’ and ‘Avis Car Hire’ are available on the island including roadside renters that you’ll find parked along beachfront roads that mostly hire out jeeps. Take note that driving in Phuket is not for nervous drivers. Large and small motorcycles can also be rented. Phuket Airport has two taxi operators that can be costly because of competition and your cheapest option is to share a mini-bus, but it takes longer although you’ll get to see which hotels the other passengers are staying at. The best solution if you’re not hiring a vehicle from ‘Avis’ or ‘Hertz’ and your hotel doesn’t provide transfers, is to have a pre-booked private taxi waiting for you when you arrive.